As I lay here, rendered useless by the claws of sickness, I withdraw deeply within the depths of my mind. On days like this, sometimes it is even too much effort for me to differentiate between reality and imagination, between pain and bliss; so I cease thinking and give up trying to control the wanderings of my mind. I just feel. After staying up all night concocting a French essay for my Business French class, I feel as though I need to sleep... I want to sleep. But I can't? I remember this memory that occurred not so long ago but also at the beginnings of the development of my conscious being. This memory is actually more of a tangible reminder of all that is not a memory in my head, of all the void space that I have neglected to fill in my vast mind. I remember this day so clearly, as if something magnificent actually happened on this bland afternoon's drive down a familiar road. I was passing my day as I always pass my days, feeling as if time is a renewable resource and eternity will never escape the grasp of my hand. I had not braced myself for the moment when reality would rip out my skewed mind and hang it before me to realize my errors. I was driving up the same hill that I had already taken for granted many times, past the same houses that held the same people who I would never talk to and would cease to remember every time I passed their house. Again and Again. But this time, as I approached the top of the hill, reality ceased to exist. 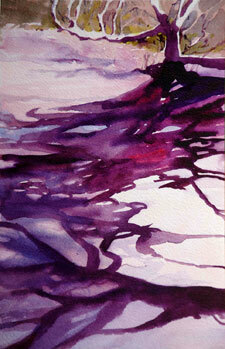 The shadows underneath the trees danced and swirled to paint huge glistening puddles across the streets. At the time, I did not realize that these were in fact the mere shadows of the same trees that I had neglected only hours before. These were massive puddles that glistened in the sun, succeeding at giving me very early cardiac arrest as I slammed on my breaks in fear and awe at the spectacle. The vision faded as quickly as it appeared, once the machine of my mind once again took the calculations of reality into its grasp. My mind had been fooled; Oh foolish machine, how easily you lose your equilibrium! Don't you realize that every vision on this planet must abide by the conditioned mathematical equations that torment our reality? Oh foolish creature, how I pity you.